petebrookshaw.com: General André Cox - The Salvation Army's 20th General - My insights! General André Cox - The Salvation Army's 20th General - My insights! Who is the next General of The Salvation Army? 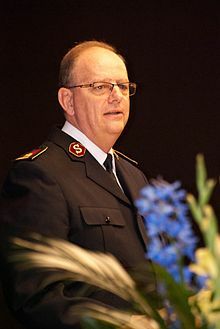 On the 3rd August, 2013, The Salvation Army High Council decided that Commissioner André Cox would become the next General of The Salvation Army. He becomes the 20th General within the history of the movement, that began under General William Booth in the late 1800s. Many have commented and reflected in recent days about the life and ministry of The Salvation Army. Those who are Salvationists have, for the most part, been very keen in praying for and discussing the ins and outs of the global movement. What has been the consensus? For what it is worth, let me offer you some of my own insights. The Salvation Army must keep its eyes focussed on Christ. Sure, you may say that is a given. Maybe you even say that sounds too simplistic. Maybe it should go without saying. The challenge, from my perspective, is to keep this the main thing. In the ever increasing complexities of social policy, engagement with media, keeping a well respected global brand, administrative and financial demands and the like, we MUST keep our eyes on Jesus. We must, continue to be a movement that reconciles the world back to its creator, through an ever increasing impact on the global environment. Anything less sells us out to the devil. Should the Commissioners who gather for the High Council be so old? Does that affect positively or negatively on the life of The Salvation Army? Should the candidates who are selected by the High Council members be reflective of the demographics of the global Salvation Army? Should we have a General who is innovative and forward-thinking, or an administrator, or can they co-exist? People on the grassroots, expressing Salvationism on the streets with the broken and hurting of our communities, are concerned about these particular issues. Many are hoping their voice would be heard. A flattening of perceived distance between a Commissioner and a soldier. The General of The Salvation Army needs to freely, continually and passionately communicate to The Salvation Army the vision and dreams for the future. This should not be done just within conventional avenues of communication. IHQ (International Headquarters), should be challenged to continue to pursue to a greater degree the dissemination of inspiring resources and vision-casting within all the practical realms of communication offered to us in the 21st Century. We must pray for the General. We need to ask the Lord to bless General André Cox. We should be supporting them for the sake of the Kingdom of God and what God intends to do through The Salvation Army in the future. I am absolutely convinced of one thing. Absolutely convinced, without a shadow of a doubt. The best days are still ahead for The Salvation Army. Not just great days, but the best days. Let me go further (and this is where I might lose some readers...), to say that I believe that God will use The Salvation Army is such a mighty and powerful way in the future, that will lead many to the cross of Calvarly. When the power and presence of the Holy Spirit comes upon The Salvation Army in this new season, the world will not be the same. The whole world will once again be impacted by the Blood and Fire to a new degree. Who knows, it may even bring on the return of Jesus himself! You may not believe it. You may have theological justifications to support other claims and God bless you in those God-inspired pursuits. What I am saying is that, God wants to FIRE UP The Salvation Army to be more than what it even is at present. I praise God for the new General of The Salvation Army. I praise God for what is happening in many parts of the global Salvation Army. Though, I cannot be satisfied. SalvoKat - The Generals in pictures!! "technologically inept" .... I am not sure that this applies because of the ages or ranks of the Officers in "'high-level' executive leadership" but rather the places where they serve. The Officers I know in "'high-level' executive leadership" are users of technology and social media. Many are located in third world places and yet still are capable users. Now are they as good as a 13 year old American girl? No but none of are. As all of us learn more by utilizing this medium we will get better at it. While I am a big proponent of technology I still want my General to be better at preaching Jesus than using Twitter or Facebook.